For the mountain in the Sud Yungas Province, La Paz Department, Bolivia, see Qalsata (Sud Yungas). 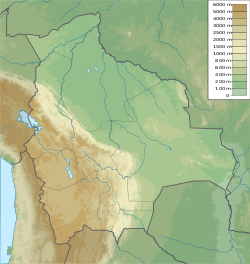 Calzada (possibly from Aymara qalsa, stones; or Spanish calzada, road) is a mountain in the Andes, about 5,874 m (19,272 ft) high, located in the Cordillera Real of Bolivia. It lies in the La Paz Department, Larecaja Province, on the border of the Sorata Municipality and the Guanay Municipality. It is situated south-east of Ancohuma, between the mountain Q'asiri in the north-west and Chearoco in the south-east, and east of San Francisco Lake. ^ a b "Jill Neate, Mountaineering in the Andes" (PDF). rgs.org. ^ wikimapia.org "Nevado Calzada "
^ Biggar, John (2005). The Andes: A Guide for Climbers. Andes. p. 138. ISBN 9780953608720. This page was last edited on 23 July 2018, at 00:07 (UTC).